Embroidered sheer panels create a delicate finish to a floor length gown. This sleeveless formal dress features a full chiffon skirt with a satin waist band that flatters all body types, from petite to plus sizes. Embroidered petals give a lacy effect that meanders around the lower bodice of the floor length dress. Illusion panels cover the bodice and shoulders of this chiffon dress. Framing a deep V back and jewel neckline, sheer panels create a romantic and demure formal dress at the shoulders. A full length underlining with a sweetheart neckline coordinates with colors of this formal gown. This long dress is an excellent choice for bridesmaids, prom or formal balls and receptions. Choose from junior or plus sizes in this embroidered sheer panel formal gown. A center back zipper makes this floor length dress easy to wear. 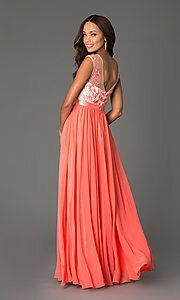 Buy a long chiffon dress with embroidered sheer panels for delicate and lacy look for prom 2019. The model in coral is 5' 7.5" and wearing 3" heels.